In figure (12−E3) k = 100 N m−1, M = 1 kg and F = 10 N. (a) Find the compression of the spring in the equilibrium position. (b) A sharp blow by some external agent imparts a speed of 2 m s−1 to the block towards left. Find the sum of the potential energy of the spring and the kinetic energy of the block at this instant. (c) Find the time period of the resulting simple harmonic motion. (d) Find the amplitude. (e) Write the potential energy of the spring when the block is at the left extreme. (f) Write the potential energy of the spring when the block is at the right extreme. The answer of (b), (e) and (f) are different. Explain why this does not violate the principle of conservation of energy. ∴ x=Fk=10100 =0.1 m=10 cm(b) The blow imparts a speed of 2 ms-1 to the block, towards left. =2π1100=π5 s(d) Let A be the amplitude. Amplitude is the distance between the mean and the extreme position. At the extreme position, compression of the spring will be (A + x). As the work is done by the external force of 10 N, different values of options (b), (e) and (f) do not violate the law of conservation of energy. Find the time period of the oscillation of mass m in figures 12−E4 a, b, c. What is the equivalent spring constant of the pair of springs in each case? (b) Let x be the displacement of the block of mass m, towards left. (c) Let K be the equivalent spring constant of the series combination. The spring shown in figure (12−E5) is unstretched when a man starts pulling on the cord. The mass of the block is M. If the man exerts a constant force F, find (a) the amplitude and the time period of the motion of the block, (b) the energy stored in the spring when the block passes through the equilibrium position and (c) the kinetic energy of the block at this position. E=12kx2=12kFk2=12F2k(b) At the mean position, potential energy is zero. A particle of mass m is attatched to three springs A, B and C of equal force constants k as shown in figure (12−E6). If the particle is pushed slightly against the spring C and released, find the time period of oscillation. (a) Let us push the particle lightly against the spring C through displacement x. As a result of this movement, the resultant force on the particle is kxâ€‹. Repeat the previous exercise if the angle between each pair of springs is 120° initially. As the particle is pushed against the spring C by the distance x, it experiences a force of magnitude kx. The springs shown in the figure (12−E7) are all unstretched in the beginning when a man starts pulling the block/ The man exerts a constant force F on the block. Find the amplitude and the frequency of the motion of the block. As the block of mass M is pulled, a net resultant force is exerted by the three springs opposing the motion of the block. Now, springs k2 and k3 are in connected as a series combination. Let k4 be the equivalent spring constant. ∴1k4=1k2+1k3=k2+k3k2k3k4=k2k3k2+k3k4 and k1 form a parallel combination of springs. Hence, equivalent spring constant k = k1 + k4. Find the elastic potential energy stored in each spring shown in figure (12−E8), when the block is in equilibrium. Also find the time period of vertical oscillation of the block. All three spring attached to the mass M are in series. k1, k2, k3 are the spring constants. Let k be the resultant spring constant. Let x1, x2, and x3 be the displacements of the springs having spring constants k1, k2 and k3 respectively. The string, the spring and the pulley shown in figure (12−E9) are light. Find the time period of the mass m.
Let l be the extension in the spring when mass m is hung. Let x be the extension in the string on applying a force F.
Driving force is the difference between tensions T1 and T2. Solve the previous problem if the pulley has a moment of inertia I about its axis and the string does not slip over it. Let us try to solve the problem using energy method. δ = mgkLet x be any position below the equilibrium during oscillation. Let v be the velocity of mass m and ω be the angular velocity of the pulley. Consider the situation shown in figure (12−E10). Show that if the blocks are displaced slightly in opposite direction and released, they will execute simple harmonic motion. Calculate the time period. The centre of mass of the system should not change during simple harmonic motion. Therefore, if the block m on the left hand side moves towards right by distance x, the block on the right hand side should also move towards left by distance x. The total compression of the spring is 2x. A rectangle plate of sides a and b is suspended from a ceiling by two parallel string of length L each (figure 12−E11). The separation between the string is d. The plate is displaced slightly in its plane keeping the strings tight. Show that it will execute simple harmonic motion. Find the time period. Let m is the mass of rectangular plate and x is the displacement of the rectangular plate. During the oscillation, the centre of mass does not change. a = Fm = gsinθFor small values of θ, sinθ can be taken as equal to θ.
a=gθ=gxL Where g and L are constant.It can be seen from the above equation that, a α x. Hence, the motion is simple harmonic. A 1 kg block is executing simple harmonic motion of amplitude 0.1 m on a smooth horizontal surface under the restoring force of a spring of spring constant 100 N m−1. A block of mass 3 kg is gently placed on it at the instant it passes through the mean position. Assuming that the two blocks move together, find the frequency and the amplitude of the motion. T=2πMkOn substituting the values of M and k in the bove equation, we have: T=2π4100=2π5 sFrequency of the motion is given by, 1T=52π HzLet v be the velocity of the 1 kg block, at mean position. Substituting the value of x in above equation and solving for v, we get:12×1×v2=12×1000.12 v=1 ms-1 …1When the 3 kg block is gently placed on the 1 kg block, the 4 kg mass and the spring become one system. As a spring-mass system experiences external force, momentum should be conserved. Let V be the velocity of 4 kg block. Mean value of kinetic energy is given as,KE at mean position=12MV2 =12×4×142=12×14=18At the extreme position, the spring-mass system has only potential energy. PE=12kδ2=12×14where δ is the new amplitude. A simple pendulum of length l is suspended from the ceiling of a car moving with a speed v on a circular horizontal road of radius r. (a) Find the tension in the string when it is at rest with respect to the car. (b) Find the time period of small oscillation. It is given that a car is moving with speed v on a circular horizontal road of radius r.
(a) Let T be the tension in the string. A person goes to bed at sharp 10.00 pm every day. Is it an example of periodic motion? If yes, what is the time period? If no, why? No. As motion is a change in position of an object with respect to time or a reference point, it is not an example of periodic motion. A particle executing simple harmonic motion comes to rest at the extreme positions. Is the resultant force on the particle zero at these positions according to Newton’s first law? No. The resultant force on the particle is maximum at the extreme positions. Can simple harmonic motion take place in a non-inertial frame? If yes, should the ratio of the force applied with the displacement be constant? Yes. Simple harmonic motion can take place in a non-inertial frame. However, the ratio of the force applied to the displacement cannot be constant because a non-inertial frame has some acceleration with respect to the inertial frame. Therefore, a fictitious force should be added to explain the motion. A particle executes simple harmonic motion. If you are told that its velocity at this instant is zero, can you say what is its displacement? If you are told that its velocity at this instant is maximum, can you say what is its displacement? No, we cannot say anything from the given information. To determine the displacement of the particle using its velocity at any instant, its mean position has to be known. A small creature moves with constant speed in a vertical circle on a bright day. Does its shadow formed by the sun on a horizontal plane move in a sample harmonic motion? Yes, its shadow on a horizontal plane moves in simple harmonic motion. The projection of a uniform circular motion executes simple harmonic motion along its diameter (which is the shadow on the horizontal plane), with the mean position lying at the centre of the circle. A particle executes simple harmonic motion Let P be a point near the mean position and Q be a point near an extreme. The speed of the particle at P is larger than the speed at Q. Still the particle crosses P and Q equal number of times in a given time interval. Does it make you unhappy? No. It does not make me unhappy because the number of times a particle crosses the mean and extreme positions does not depend on the speed of the particle. In measuring time period of a pendulum, it is advised to measure the time between consecutive passage through the mean position in the same direction. This is said to result in better accuracy than measuring time between consecutive passage through an extreme position. Explain. The mean position of a particle executing simple harmonic motion is fixed, whereas its extreme position keeps on changing. Therefore, when we use stop watch to measure the time between consecutive passage, we are certain about the mean position. It is proposed to move a particle in simple harmonic motion on a rough horizontal surface by applying an external force along the line of motion. Sketch the graph of the applied force against the position of the particle. Note that the applied force has two values for a given position depending on whether the particle is moving in positive or negative direction. Figure (a) shows the graph of the applied force against the position of the particle. Can the potential energy in a simple harmonic motion be negative? Will it be so if we choose zero potential energy at some point other than the mean position? No. It cannot be negative because the minimum potential energy of a particle executing simple harmonic motion at mean position is zero. The potential energy increases in positive direction at the extreme position. However, if we choose zero potential energy at some other point, say extreme position, the potential energy can be negative at the mean position. E=12m ω2A2.Which of the following two statements is more appropriate? (A) The energy is increased because the amplitude is increased. (B) The amplitude is increased because the energy is increased. E=12m ω2A2.If the mass (m) and angular frequency (ω) are made constant, Energy (E) becomes proportional to the square of amplitude (A2). Therefore, according to the relation, energy increases as the amplitude increases. A pendulum clock gives correct time at the equator. Will it gain time or loose time as it is taken to the poles? T=2πlgThe time period (T) of the pendulum becomes proportional to the square root of inverse of g if the length of the pendulum is kept constant. T∝1gAlso, acceleration due to gravity (g) at the poles is more than that at equator. Therefore, the time period decreases and the clock gains time. Can a pendulum clock be used in an earth-satellite? T=2πlgThe time period of the pendulum clock depends upon the acceleration due to gravity. As the earth-satellite is a free falling body and its geffective (effective acceleration due to gravity ) is zero at the satellite, the time period of the clock is infinite. A hollow sphere filled with water is used as the bob of a pendulum. Assume that the equation for simple pendulum is valid with the distance between the point of suspension and centre of mass of the bob acting as the effective length of the pendulum. If water slowly leaks out of the bob, how will the time period vary? As the effective length of the pendulum first increases and then decreases, the time period first increases and then decreases. A block of known mass is suspended from a fixed support through a light spring. Can you find the time period of vertical oscillation only by measuring the extension of the spring when the block is in equilibrium? T=2πmmgx0=2πx0gThus, we can find the time period if the value of extension x0 is known. A platoon of soldiers marches on a road in steps according to the sound of a marching band. The band is stopped and the soldiers are ordered to break the steps while crossing a bridge. Why? When the frequency of soldiers’ feet movement becomes equal to the natural frequency of the bridge, and resonance occurs between soldiers’ feet movement and movement of the bridge, maximum transfer of energy occurs from soldiers’ feet to the bridge, which increases the amplitude of vibration. A continued increase in the amplitude of vibration, however, may lead to collapsing of the bridge. The force acting on a particle moving along X-axis is F = −k(x − vo t) where k is a positive constant. An observer moving at a constant velocity v0 along the X-axis looks at the particle. What kind of motion does he find for the particle? As the observer moves with a constant velocity along the same axis, he sees the same force on the particle and finds the motion of the particle is not simple harmonic motion. F=-kxon a particle and the particle moved in simple harmonic motion. He refuses to tell whether k is a constant or not. Assume that he was worked only with positive x and no other force acted on the particle. (a) As x increases k increases. (b) As x increases k decreases. (c) As x increases k remains constant. (d) The motion cannot be simple harmonic. x is displacement of the body from the mean position. x. Thus, as x increases k increases. One oscillation is said to be completed when the particle returns to the extreme position i.e. from where it started. Because the time period of a simple harmonic motion is defined as the time taken to complete one oscillation. Displacement is defined as the distance between the starting and the end point through a straight line. In one complete oscillation, the net displacement is zero as the particle returns to its initial position. 2A + 2A = 4A. d2dt2r→=-ω2 r→But there is a phase difference of 90o between the x and y components because of which the particle executes a circular motion and hence, the projection of the particle on the diameter executes a simple harmonic motion. Figure represents two simple harmonic motions. Because the direction of motion of particles A and B is just opposite to each other. Let m1 be the mass of the other particle and ω1 be its angular frequency. 12mω2A2It is the total energy in simple harmonic motion in one time period. Because in one complete oscillation, the kinetic energy changes its value from zero to maximum, twice. where A is amplitude and ω is the angular frequency. ν=12πkm) of the system is independent of the acceleration of the system. As the frequency of the system is independent of the acceleration of the system. The acceleration due to gravity at moon is g/6. Because the time period of a spring-mass system does not depend on the acceleration due to gravity. 2πlgAt higher altitudes, the value of acceleration due to gravity decreases. Therefore, the length of the pendulum should be decreased to compensate for the decrease in the value of acceleration due to gravity. As the acceleration due to gravity acting on the bob of pendulum, due to free fall gives a torque to the pendulum, the bob goes in a circular path. (a) A simple harmonic motion is necessarily periodic. (b) A simple harmonic motion is necessarily oscillatory. (c) An oscillatory motion is necessarily periodic. (d) A periodic motion is necessarily oscillatory. A periodic motion need not be necessarily oscillatory. For example, the moon revolving around the earth. Also, an oscillatory motion need not be necessarily periodic. For example, damped harmonic motion. Because the particle covers one rotation after a fixed interval of time but does not oscillate around a mean position. Because the particle completes one rotation in a fixed interval of time but does not oscillate around a mean position. As the particle does not complete one rotation in a fixed interval of time, neither does it oscillate around a mean position. Because it completes one oscillation in a fixed interval of time and the oscillations are in terms of rotation of the body through some angle. Which of the following quantities are always negative in a simple harmonic motion? a⇀.r⇀will also be negative, always. Which of the following quantities are always positive in a simple harmonic motion? Which of the following quantities are always zero in a simple harmonic motion? F⇀, a⇀, r⇀ and v⇀are either parallel or anti-parallel to each other, their cross products will always be zero. If the particle were dropped from the surface of the earth, the motion of the particle would be SHM. But when it is dropped from a height h, the motion of the particle is not SHM because there is no horizontal velocity imparted. In that case, the motion of the particle would be periodic and in a straight line. A particle executes simple harmonic motion with an amplitude of 10 cm and time period 6 s. At t = 0 it is at position x = 5 cm going towards positive x-direction. Write the equation for the displacement x at time t. Find the magnitude of the acceleration of the particle at t = 4 s.
ϕis phase of the particle. The position, velocity and acceleration of a particle executing simple harmonic motion are found to have magnitude 2 cm, 1 m s−1 and 10 m s−2 at a certain instant. Find the amplitude and the time period of the motion. Velocity of the particle, v = 1 ms−1. Acceleration of the particle, a = 10 ms−2. ω be the angular frequency of the particle. A particle executes simple harmonic motion with an amplitude of 10 cm. At what distance from the mean position are the kinetic and potential energies equal? A be the amplitude of the simple harmonic motion. 52 cm from the mean position. The maximum speed and acceleration of a particle executing simple harmonic motion are 10 cm s−1 and 50 cm s−2. Find the position(s) of the particle when the speed is 8 cm s−1. ω is angular frequency, and A is amplitude of the particle. v is velocity of the particle. A particle having mass 10 g oscillates according to the equation x = (2.0 cm) sin [(100 s−1)t + π/6]. Find (a) the amplitude, the time period and the spring constant. (c) the position, the velocity and the acceleration at t = 0. (a) Amplitude, A is 2 cm. Angular frequency, ω is 100 s−1â€‹. (c) first have maximum speed? (a) Maximum displacement from the mean position is equal to the amplitude of the particle. As the velocity of the particle is zero at extreme position, it is at rest. ∴ Displacementx = 5, which is also the amplitude of the particle. It is given that a particle executes S.H.M. As the particle comes to rest, its velocity becomes be zero. Consider a simple harmonic motion of time period T. Calculate the time taken for the displacement to change value from half the amplitude to the amplitude. Let y1 and y2 be the displacements at the two positions and A be the amplitude. The pendulum of a clock is replaced by a spring-mass system with the spring having spring constant 0.1 N m−1. What mass should be attached to the spring? Mass attached to the string, m, is to be found. A block suspended from a vertical spring is in equilibrium. Show that the extension of the spring equals the length of an equivalent simple pendulum, i.e., a pendulum having frequency same as that of the block. An equivalent simple pendulum has same time period as that of the spring mass system. g is acceleration due to gravity. Let x be the extension of the spring. For small frequency, TP â€‹can be taken as equal to TS. A block of mass 0.5 kg hanging from a vertical spring executes simple harmonic motion of amplitude 0.1 m and time period 0.314 s. Find the maximum force exerted by the spring on the block. A body of mass 2 kg suspended through a vertical spring executes simple harmonic motion of period 4 s. If the oscillations are stopped and the body hangs in equilibrium, find the potential energy stored in the spring. T=2πmkwhere k is the spring constant. -kmxThus, acceleration is proportional to the displacement from the mean position but in opposite direction. (i⇀+2j⇀)A, following equation of straight line y = mx + c. Also, a simple harmonic motion is periodic. x=x02(cos 2ωt- 1)Now, the amplitude of the particle is xo/2 and the angular frequency of the SHM is 2ω. (d) the average potential energy in one time period is equal to the average kinetic energy in this period. 12kA2 sin2 ωtAs the average of the cosine and the sine function is equal to each other over the total time period of the functions, the average potential energy in one time period is equal to the average kinetic energy in this period. 12kA2The minimum value of both kinetic and potential energy is zero. Therefore, in a simple harmonic motion the maximum kinetic energy and maximum potential energy are equal. Also, the minimum kinetic energy and the minimum potential energy are equal. The effect of gravity on the object as well as on the pendulum clock is same in both cases; the time measured is also same. As the time measured is same, the speeds are same. Which of the following will change the time period as they are taken to moon? As the time period of a simple pendulum and a physical pendulum depends on the acceleration due the gravity, the time period of these pendulums changes when they are taken to the moon. A spring stores 5 J of energy when stretched by 25 cm. It is kept vertical with the lower end fixed. A block fastened to its other end is made to undergo small oscillations. If the block makes 5 oscillations each second, what is the mass of the block? A small block of mass m is kept on a bigger block of mass M which is attached to a vertical spring of spring constant k as shown in the figure. The system oscillates vertically. (a) Find the resultant force on the smaller block when it is displaced through a distance x above its equilibrium position. (b) Find the normal force on the smaller block at this position. When is this force smallest in magnitude? (c) What can be the maximum amplitude with which the two blocks may oscillate together? (a) Consider the free body diagram. 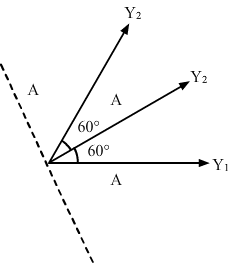 x is the small displacement of mass m.
=mg-mkM+Nx=mg-mkxM+NIt can be seen from the above equations that, for R to be smallest, the value of mω2x should be maximum which is only possible when the particle is at the highest point. As the two blocks oscillate together R becomes greater than zero. The block of mass m1 shown in figure (12−E2) is fastened to the spring and the block of mass m2 is placed against it. (a) Find the compression of the spring in the equilibrium position. (b) The blocks are pushed a further distance (2/k) (m1 + m2)g sin θ against the spring and released. Find the position where the two blocks separate. (c) What is the common speed of blocks at the time of separation? x1=2km1+m2g sin θAs the system is released, it executes S.H.M. ∴ m2g sin θ=m2x2ω2=m2x2×km1+m2⇒x2=m1+m2 g sin θkTherefore, the blocks lose contact with each other when the spring attains its natural length. (c) Let v be the common speed attained by both the blocks. The left block in figure (12−E13) moves at a speed v towards the right block placed in equilibrium. All collisions to take place are elastic and the surfaces are frictionless. Show that the motions of the two blocks are periodic. Find the time period of these periodic motions. Neglect the widths of the blocks. According to the question, the collision is elastic and the surface is frictionless, therefore, when the left block A moves with speed v and collides with the right block B, it transfers all the energy to the right block B. The left block A moves a distance x against the spring; the right block returns to the original position and completes half of the oscillation. T=2πmk2=πmkRight block B collides with left block A and comes to rest. Let L be the distance moved by the block to return to its original position. Find the time period of the motion of the particle shown in figure (12−E14). Neglect the small effect of the bend near the bottom. Let t1 and t2 be the time taken by the particle to travel distances AB and BC respectively. The distance travelled along AB is s1. u be the initial velocity. All the surfaces shown in figure (12−E15) are frictionless. The mass of the care is M, that of the block is m and the spring has spring constant k. Initially, the car and the block are at rest and the spring is stretched through x length x0 when the system is released. (a) Find the amplitudes of the simple harmonic motion of the block and of the care as seen from the road. (b) Find the time period(s) of the two simple harmonic motions. Let x1 and x2 be the amplitudes of oscillation of masses m and M respectively. 12kx02=12kx1+x22 …(2) where x0 is the length to which spring is stretched. Let v1 and v2 be the velocities. 12Mv2+12mv1-v22+12kx1+x22=constant …3Here, (v1 − v2) is the absolute velocity of mass m as seen from the road. A uniform plate of mass M stays horizontally and symmetrically on two wheels rotating in opposite direction (figure 12−E16). The separation between the wheels is L. The friction coefficient between each wheel and the plate is μ. Find the time period of oscillation of the plate if it is slightly displaced along its length and released. Let x be the displacement of the uniform plate towards left. Therefore, the centre of gravity will also be displaced through displacement x. A pendulum having time period equal to two seconds is called a seconds pendulum. Those used in pendulum clocks are of this type. Find the length of a second pendulum at a place where g = π2 m s−2. T=2πlgwhere l is the length of the second pendulum. ⇒2=2πlπ2⇒1π=lπ⇒l=1 mHence, the length of the pendulum is 1 m.
θ=π90 sin π s-1t. Find the length of the pendulum if g = π2 m−2. It is given that:Angle made by the simple pendulum with the vertical, θ=π90sin πs-1tOn comparing the above equation with the equation of S.H.M., we get: ω= π s-1 ⇒2πT=π∴ T=2 sTime period is given by the relation,T=2πlg⇒2=2πlπ2⇒1=π1πl⇒l=1 mHence, length of the pendulum is 1 m.
The pendulum of a certain clock has time period 2.04 s. How fast or slow does the clock run during 24 hours? In each oscillation, the clock gets slower by (2.04 − 2.00) s, i.e., 0.04 s.
Thus, the clock runs 28.8 minutes slow during 24 hours. A pendulum clock giving correct time at a place where g = 9.800 m s−2 is taken to another place where it loses 24 seconds during 24 hours. Find the value of g at this new place. Let T2 be the time period at the place where the pendulum clock loses 24 seconds during 24 hours. A simple pendulum is constructed by hanging a heavy ball by a 5.0 m long string. It undergoes small oscillations. (a) How many oscillations does it make per second? (b) What will be the frequency if the system is taken on the moon where acceleration due to gravitation of the moon is 1.67 m s−2? π(0.7) seconds to complete an oscillation. The maximum tension in the string of an oscillating pendulum is double of the minimum tension. Find the angular amplitude. In a moving pendulum, the tension is maximum at the mean position, whereas it is minimum at the extreme position. A small block oscillates back and forth on a smooth concave surface of radius R (figure 12−E17). Find the time period of small oscillation. It is given that R is the radius of the concave surface. â€‹Let N be the normal reaction force. Let x be the displacement of the body from mean position. ⇒a=xgRAs acceleration is directly proportional to the displacement. Hence, the body will execute S.H.M. A spherical ball of mass m and radius r rolls without slipping on a rough concave surface of large radius R. It makes small oscillations about the lowest point. Find the time period. Let ω be the angular velocity of the system about the point of suspension at any time. where ω1 is the rotational velocity of the sphere. gR-rsinθdθdt=710R-r22ωdωdt⇒gsinθ=2×710R-rα ∵ a=dωdt⇒gsinθ=75R-rα⇒α=5gsinθ7R-r =5gθ7R-r∴αθ=ω2=5g7R-r=constantTherefore, the motion is S.H.M. A simple pendulum of length 40 cm is taken inside a deep mine. Assume for the time being that the mine is 1600 km deep. Calculate the time period of the pendulum there. Radius of the earth = 6400 km. g’be the acceleration due to gravity at a depth of 1600 km from the surface of the earth. Radius of the earth is R.
Let mass of the part of earth having radius x be M‘. gR=gRA2-R2 ⇒R2=A2-R2⇒A=2RLet t1 and t2 be the time taken by the particle to reach the positions X and Y. Change in P.E. = Gain in K.E. ⇒GMmR-GMm2R=12mv2⇒v=gR As the velocity is same as that at X, the body will take the same time to travel XY. gR. Its velocity becomes zero as it reaches the highest point. v=gR Hence, the body will take same time i.e. Assume that a tunnel is dug along a chord of the earth, at a perpendicular distance R/2 from the earth’s centre where R is the radius of the earth. The wall of the tunnel is frictionless. (a) Find the gravitational force exerted by the earth on a particle of mass m placed in the tunnel at a distance x from the centre of the tunnel. (b) Find the component of this force along the tunnel and perpendicular to the tunnel. (c) Find the normal force exerted by the wall on the particle. (d) Find the resultant force on the particle. (e) Show that the motion of the particle in the tunnel is simple harmonic and find the time period. A simple pendulum of length l is suspended through the ceiling of an elevator. Find the time period of small oscillations if the elevator (a) is going up with and acceleration a0 (b) is going down with an acceleration a0 and (c) is moving with a uniform velocity. The length of the simple pendulum is l.
â€‹Let x be the displacement of the simple pendulum..
As the acceleration is directly proportional to displacement, the pendulum executes S.H.M. A simple pendulum of length 1 feet suspended from the ceiling of an elevator takes π/3 seconds to complete one oscillation. Find the acceleration of the elevator. â€‹Let a be the acceleration of the elevator while moving upwards. A simple pendulum fixed in a car has a time period of 4 seconds when the car is moving uniformly on a horizontal road. When the accelerator is pressed, the time period changes to 3.99 seconds. Making an approximate analysis, find the acceleration of the car. T=2πlg⇒4=2πlgLet the acceleration of the car be a. The ear-ring of a lady shown in figure (12−E18) has a 3 cm long light suspension wire. (a) Find the time period of small oscillations if the lady is standing on the ground. (b) The lady now sits in a merry-go-round moving at 4 m s−1 in a circle of radius 2 m. Find the time period of small oscillations of the ear-ring. As the lady sits on the merry-go-round, her earring experiences centripetal acceleration. Find the time period of small oscillations of the following systems. (a) A metre stick suspended through the 20 cm mark. (b) A ring of mass m and radius r suspended through a point on its periphery. (c) A uniform square plate of edge a suspended through a corner. (d) A uniform disc of mass m and radius r suspended through a point r/2 away from the centre. T=2πImglOn substituting the respective values in the above equation, we have:T=2π2mr2mgr =2π2rg(c) Let I be the moment of inertia of a uniform square plate suspended through a corner. A uniform rod of length l is suspended by an end and is made to undergo small oscillations. Find the length of the simple pendulum having the time period equal to that of the road. It is given that the length of the rod is l.
Let point A be the suspension point and point B be the centre of gravity. I=ICG+mh2 =ml212+ml24=ml23the time period T is given by,T=2πImgl’=2πImgl2 =2π2ml23mgl=2π2l3gLet T‘ be the time period of simple pendulum of length x. A uniform disc of radius r is to be suspended through a small hole made in the disc. Find the minimum possible time period of the disc for small oscillations. What should be the distance of the hole from the centre for it to have minimum time period? Let m be the mass of the disc and r be its radius. Consider a point at a distance x from the centre of gravity. A hollow sphere of radius 2 cm is attached to an 18 cm long thread to make a pendulum. Find the time period of oscillation of this pendulum. How does it differ from the time period calculated using the formula for a simple pendulum? % change in the value of time period=0.89-0.860.89×100=0.3∴ It is about 0.3% greater than the calculated value. A closed circular wire hung on a nail in a wall undergoes small oscillations of amplitude 20 and time period 2 s. Find (a) the radius of the circular wire, (b) the speed of the particle farthest away from the point of suspension as it goes through its mean position, (c) the acceleration of this particle as it goes through its mean position and (d) the acceleration of this particle when it is at an extreme position. Take g = π2 m s−2. Let I be the moment of inertia of the circular wire having mass m and radius r.
(c) The acceleration is found to be centripetal at the extreme position. The direction of an is towards the point of suspension. (d) The particle has zero centripetal acceleration at the extreme position. However, the particle will still have acceleration due to the S.H.M. A uniform disc of mass m and radius r is suspended through a wire attached to its centre. If the time period of the torsional oscillations be T, what is the torsional constant of the wire? The time period of torsional oscillations is T.
k is the torsional constant. Two small balls, each of mass m are connected by a light rigid rod of length L. The system is suspended from its centre by a thin wire of torsional constant k. The rod is rotated about the wire through an angle θ0 and released. Find the force exerted by the rod on one of the balls as the system passes through the mean position. It is given that the mass of both the balls is m and they are connected to each other with the help of a light rod of length L.
A particle is subjected to two simple harmonic motions of same time period in the same direction. The amplitude of the first motion is 3.0 cm and that of the second is 4.0 cm. Find the resultant amplitude if the phase difference between the motions is (a) 0°, (b) 60°, (c) 90°. It is given that a particle is subjected to two S.H.M.s of same time period in the same direction. Let Ï• be the phase difference. Three simple harmonic motions of equal amplitude A and equal time periods in the same direction combine. The phase of the second motion is 60° ahead of the first and the phase of the third motion is 60° ahead of the second. Find the amplitude of the resultant motion. It is given that three S.H.M.s of equal amplitudes A and equal time periods are combined in the same direction. Y1, Y2 and Y3be the three vectors representing the motions, as shown in the figure given below. Angle betweenY1 and Y2 = 60 °Angle between Y2 and Y3 = 60 °. By using the vector method, we can find the resultant vector. A particle is subjected to two simple harmonic motions given by x1 = 2.0 sin (100π t) and x2 = 2.0 sin (120 π t + π/3), where x is in centimeter and t in second. Find the displacement of the particle at (a) t = 0.0125, (b) t = 0.025. A particle is subjected to two simple harmonic motions, one along the X-axis and the other on a line making an angle of 45° with the X-axis. The two motions are given by x = x0 sin ωt and s = s0 sin ωt. Find the amplitude of the resultant motion.